Very few women of color become computer scientists, but the University of Texas at El Paso is trying to change that. EL PASO, Texas—Paola Gallardo had no idea her childhood hobby had a name or that people would pay her to do it. The 21-year-old just knew that she liked taking computers apart to explore the machines inside. It was something she and her dad did for fun, the way some people tossed a football or rode bikes with their fathers. She first heard the term computer science as a teen. “I didn’t know what it was until I told my sister I wanted to do something with computers,” she recalled during a break between classes at the University of Texas at El Paso, where she will soon earn a degree in the subject. Born and raised on the outskirts of this west Texas border town, Gallardo didn’t grow up in the shadow of Yahoo or Google like the kids in Silicon Valley. Her high school didn’t offer any computer-science classes. And her father, who worked at a publishing company, didn’t have money for the latest gadgets. But that didn’t stop them. “The minute my dad could get his hands on a computer, we had one in the house,” she said. It was a cheap old eMachine running Windows 95 that they opened up and peered into, trying to discern how it worked, she remembered, laughing. Soon, she was teaching herself PowerPoint and then tinkering with the code on her Myspace profile. “Everything I learned in terms of tech was on my own,” said Gallardo, a first-generation college student. Not anymore. Almost four years into her degree at UTEP, she’s surrounded by professors and mentors intent on teaching her as much about computers and coding as she wants to know. Dressed in an “I Code” tee and teal hoodie, Gallardo has the standard Silicon Valley coder’s wardrobe figured out. Unlike some of the nation’s more-heralded and exclusive computer science programs, at UTEP, Gallardo is surrounded by students who share similar backgrounds. The university deliberately focuses on serving the local population. Between 85 and 90 percent of students come from the area. Like the city of El Paso, about 80 percent of students are Latino. Many come from modest backgrounds and are the first in their families to go to college. “Other schools create programs for this slice of their student population, but everything we do is for them,” said Donna Ekal, associate provost in the office of undergraduate studies, during an interview at her office in the middle of the campus, a cluster of brightly tiled buildings and landscaped walkways that draw inspiration from the remote kingdom of Bhutan. Nationally, only about 14 percent of computer-science bachelor’s degrees go to women, and Latinas make up just a mere 1 percent of those graduates. In 2013, women comprised 26 percent of UTEP’s computer science graduates. Almost all were Latina. Since 2006, the number of women graduating with master’s degrees has increased 62 percent. Cynthia Morales, a soft-spoken senior with short dark hair and an easy smile, moved to El Paso from Mexico in seventh grade. She didn’t know what computer science was until she started googling in-demand careers in high school. Also a first-generation college student, Morales earned an associate degree in computer science at El Paso Community College before transferring to UTEP. Being unfamiliar with the subject had its advantages, like being unaware of the main stereotype about computer scientists. “I didn’t know computer science was about guys until my calculus class at community college. I was one of two girls out of 40,” Morales said. By that point, though, she was hooked. Keeping students enrolled is hard. Just 42 percent of UTEP’s first-year students earn a degree six years later, according to data from the Texas Higher Education Coordinating Board, well below the state’s 60 percent figure. And earning a degree in computer science can mean educating yourself out of the El Paso job market. Many Latinas, some by choice, others because of family pressure, feel the need to stay in the region, which can make imagining a future as a computer scientist seem impractical. Compared to cities like Phoenix and Austin, El Paso offers limited computer-science jobs. The department recently sent a cohort of young women to the Grace Hopper Celebration of Women in Computing conference in Houston. A number of families showed up at the airport to make sure their daughters, all technically adults, would be chaperoned. Handling such situations is a constant balancing act of being supportive but also fostering independence, Dr. Ann Quiroz Gates, the chair of the computer science department, said. Adriana Camacho, a 23-year-old computer-science graduate student at the university, also knew not many of the other girls in her high school were interested in engineering, but she didn’t let it phase her. As Gallardo said, “If you really like the subject, you keep going.” Some girls, she pondered aloud, might leave the field because they don’t see immediate success. Coding is all about trying, failing and trying again. That can be frustrating, all three young women agree, but it’s also the best part. And there is so much opportunity, they add, their eyes lighting up as they talk about their paths to this university, to this career—one that, until recently, was a complete unknown. Human-computer interaction, virtual reality, machine learning, entrepreneurship—Gallardo ticks off the possibilities. Their enthusiasm is something university officials here have worked hard to foster. It’s an important factor in attracting and retaining more women of color to computer science, a persistent industrywide issue that both colleges and companies like Google are working to address. Gates sits on the executive council of the Computing Alliance of Hispanic-Serving Institutions, a group formed in 2004 by colleges to increase the number of Latinos earning degrees in computer science and engineering. Members share best practices with each other, she said. Over the years, peer mentoring and involving undergraduate students in research have emerged as two strategies that help with retention. Morales works as a peer leader, encouraging younger students, especially young women, to stay enrolled. Gallardo and Camacho have both worked in research labs. The experiences have given them confidence in the face of skeptical male classmates. Morales agreed. “They see you and they think you cannot do this,” she said. Claudia Casas, the CAHSI project manager at the university and a graduate of its undergraduate and graduate computer science programs, said young women at the school appear united and supportive of each other in a way that isn’t necessarily the norm at other universities. Gates, who grew up in El Paso and had her own doubts about her ability to complete a Ph.D., knows the community. 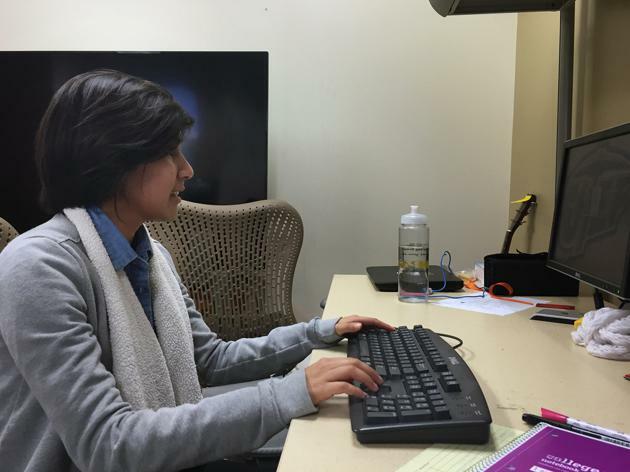 Many students support families and need to work, so her team started encouraging professors to use research grants to hire undergraduate students to work in campus labs where they could continue to hone their coding skills. The department works with students who need to attend part-time, and recognizes that test scores don’t tell the whole story when it comes to whether a prospective student can thrive in the program. “We’re just more aware,” she said, noting that colleges around the country have seen an increase in the number of Latino students in recent years, but not all have taken specific steps to address their needs. 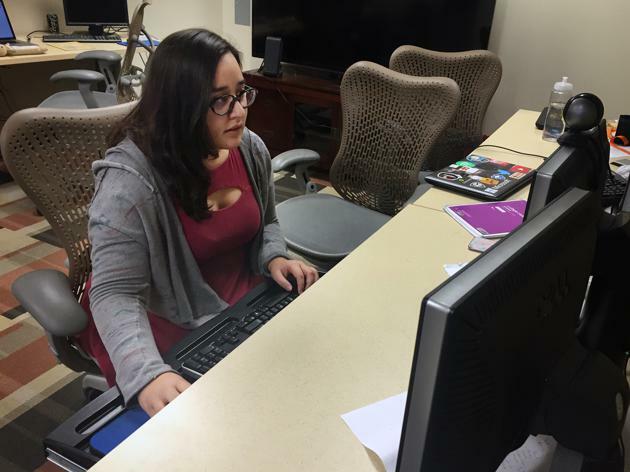 Back in the computer-science building, Gallardo, Morales, and Camacho say they think seeing more women like them portrayed on television might encourage younger Latinas to pursue computer science. “When it comes to computer science, I can’t think of a Hispanic woman computer scientist in the media,” Gallardo said. UTEP hopes that as more women of color like Gallardo pass on that attitude from college to the workforce, more girls will be able to picture themselves as computer scientists, too.